Global Corn production for 2018-19 is forecast at 1,099.9 Mio Tons, +0.1% from November projections, with increases for Ukraine (record production forecast at 35 Mio Tons), and for the European Union, especially for Romania. U.S. most recent data on ethanol production show a decrease, therefore lower Corn used for ethanol is expected. With no production and export changes, ending stocks are projected at 45.2 Mio Tons, higher from last month. Global 2018-19 Soybean production is forecast at 369.2 Mio Tons, +0.5% from November forecast. The increase is mainly due to greater Soybean production for Brazil, the second largest Soybean Producer: +1.2% from previous outlook, +1.4% from previous season, reflecting favorable weather conditions in the Center-West region. Large competitive supplies in Brazil are expected to boost the export: +5.2% compared to previous estimates, +6.3% compared to the 2017-18 season. As a result, exports from Argentina, Canada and Paraguay decreased and their stocks increased. U.S. 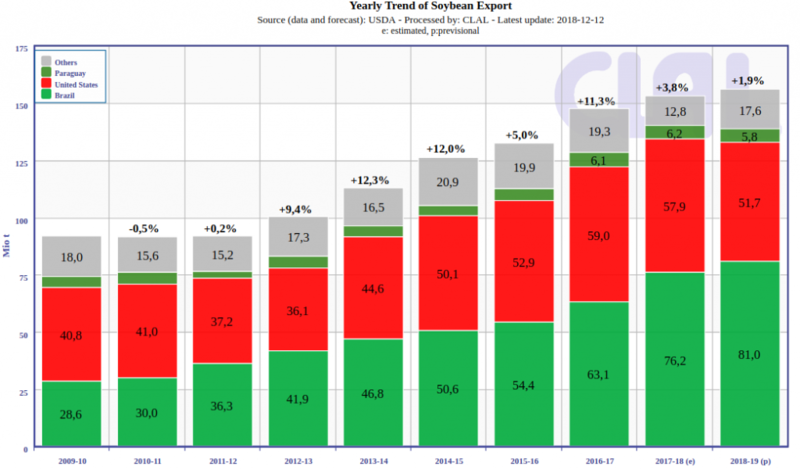 Soybean ending stock are projected at a record 26 Mio Tons, with production and export unchanged. Corn & Soybeans - December 2018: Report about prices, production and global trade prospects for 2018-19 season.